It's the time of year when I, sincerely, like to thank all of the people who have taken the time to visit my blog. It really means a lot to me, so thank you! I've been working on this piece for a while now and was hoping to get it in under the wire to be my final painting for 2018. Made it with a few hours to spare. I came across this bug in the parking lot of our local Whole Foods and took a bunch of shots for a possible future painting. I've owned two beetles in my life so I have a definite soft spot in my heart for this little car. 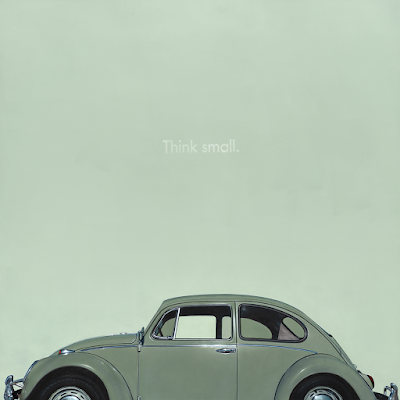 When I was working up the composition I couldn't get the 1959 DDB Advertising Agency's "Think Small" campaign out of my head, so I stole it. I made sure to use the correct typeface (futura) then matched up the kerning, and other modifications to come as close as I could to the original ad. I grew up with those ads and seeing as how this will be the final year of the beetle it felt appropriate.